20 Years After "Tear Down This Wall"
The four most famous words of Ronald Reagan's Presidency almost were never uttered. Twenty years ago, on the morning of June 12, 1987, Reagan arrived in Berlin, on the occasion of the city's 750th birthday. He was scheduled to speak on the Western side of the Brandenburg Gate, for years the city's symbolic dividing line. His speechwriters had drafted an address intended as much for Soviet leader Mikhail Gorbachev, with whom Reagan was forging a close relationship, as for the 20,000 people who gathered to hear him speak. In the speech, Reagan would call on Gorbachev to tear down the Berlin Wall, but that language was opposed strongly by Reagan's National Security Council and the State Department, who feared it would be used by hard-liners in the Kremlin to discredit Gorbachev. When the President's entourage arrived in Berlin, Reagan's team was still arguing over the final wording. State and NSC submitted yet another draft of the speech. But in the limousine ride to the Wall, Reagan told his deputy chief of staff, Kenneth Duberstein, that he intended to issue the fateful challenge to Gorbachev. "It's the right thing to do," he said. Two decades later, what can we learn from the epochal events that followed  the fall of the Berlin Wall, the reunification of Germany and the collapse of the Soviet Union? "People were afraid of the consequences of what Reagan would say," George Shultz, Reagan's long-serving Secretary of State, told me over lunch in Berlin last week. "But it turns out he was right." We were sitting in an elegant dining room overlooking the city, in a building that sits on the former border between east and west Berlin. "Saying something like, 'Mr. 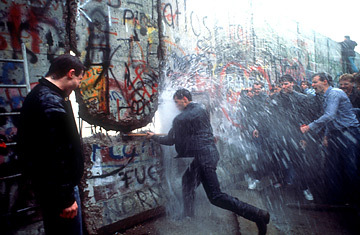 Gorbachev, tear down this wall'  that could be perceived as provocative. Things were breaking and were in a lot of flux. At the time some people argued, why stick your finger in [Gorbachev's] nose? But knowing Ronald Reagan as I did, I would have said don't bother. He was going to express his feelings." When Reagan climbed the dais, just before 2 p.m., two bulletproof panes of glass stood behind him, to protect against snipers who might target him from the East. Earlier in the day Reagan had looked across the wall into East Berlin from a balcony of the Reichstag. He later said that his forceful tone had been influenced by his learning that East German police had forced people away from the wall to prevent them from hearing his speech over the loudspeakers. As the crowd fell quiet, Reagan began his address with signature folksiness. The main speechwriter, Peter Robinson, wanted Reagan to disarm the audience at the start, so he slipped a German line into the speech's opening. "Like many Presidents before me, I come here today because wherever I go, whatever I do: Ich hab noch einen Koffer in Berlin." I still have a suitcase in Berlin. At the time, the Soviet news agency TASS called Reagan's visit to the Wall "openly provocative, war-mongering." But listen closely to a recording of it today: the speech sounds as much like an invitation as it does a challenge. "There is one sign the Soviets can make that would be unmistakable, that would advance dramatically the cause of freedom and peace," Reagan says. As he goes on, you hear scattered claps and hollers. "General Secretary Gorbachev, if you seek peace, if you seek prosperity for the Soviet Union and Eastern Europe, if you seek liberalization: Come here to this gate!" Reagan says. The crowd starts to erupt. "Mr. Gorbachev, open this gate!" At this point, 20,000 Berliners are cheering Reagan on. In his diary, published last month, Reagan wrote, "I addressed tens & tens of thousands of people  stretching as far as I could see. I got a tremendous reception  interrupted 28 times by cheers." For all its drama, the speech received relatively little media coverage. Compared to the younger, more vigorous Gorbachev, Reagan seemed to be a diminished figure on the world stage, a lame-duck President hobbled by the Iran-Contra scandal at home. But in hindsight, the "Tear Down this Wall" speech helps explain how the Cold War ended. Unlike many conservatives, Reagan believed that the U.S.-Soviet arms race was not immutable, and that the rivalry between East and West that had defined the Cold War could be defused through diplomacy and persuasion. In Gorbachev, he found a partner with whom he could do business. And in the people of Eastern Europe, including those gathered at the Brandenburg Gate that day in June, he found an audience ready to take history into their hands. On this point, Shultz says, "for anyone who came and looked at the Wall, you couldn't help but say, tear down this wall. That was your instinctive reaction to it. It was just something that shouldn't be there." Toward the end of our lunch, I asked Shultz, now 86, what lessons the world can draw from the Reagan speech at a time when the U.S. and its allies are struggling to contain the new threat of militant Islam. "President Reagan had the idea that change could happen," Shultz says. "That put him at odds with establishment thinking, which had embraced détente and assumed change would not happen. To them, you had two systems that would go on forever; peaceful coexistence was the objective. Reagan assumed change was possible and I thought so too. Your mindset makes a big difference on this. As you look at the world of Islam, you have to ask yourself, is change possible? I think it is, but we have to work on it in all sorts of ways. During the Cold War, for instance, we had major Russian research centers at universities all over the country. That's a first step. But there's nothing like that going on now. The world of Islam varies tremendously. We should try to understand all of these variations and then we want to hone our messages to appeal to different audiences. There are a lot of things we can do if we work at it, but you have to do it in a serious, thoughtful way." Shultz says that he believes that "President Bush is trying to establish a sense of direction, but he's having a hard time doing it, and one reason is the fact we're so bogged down in Iraq." On Iran, I asked whether the Administration should consider negotiating directly with the ruling mullahs in Tehran, as Reagan did with the Soviets. "I think we should figure out a way to communicate," he says. "We've seen the beginning of that in the recent meeting in Baghdad. When you have two ambassadors meet in high-publicity setting it's not likely to produce much. But anyway, it's still meeting." Later that evening, Shultz would deliver a speech of his own at an event hosted by the American Academy in Berlin, marking the 20th anniversary of the Reagan address. As our plates were being cleared, I asked why "Tear Down this Wall" remains more resonant than any of the thousands of Presidential speeches delivered in the two decades since Reagan went to Berlin. Shultz sipped some green tea. "It's become famous, first of all, because what he called for happened. If you look back to the day after the speech, or the month after, I don't think it was written about that much. But it got big reverberations once the Wall came down and people looked back at Reagan's speech and remembered that it was controversial at the time to say that. That goes back to what I was saying earlier, about the difference between containment, as it was set out originally by George Kennan, and détente, as it had come to be accepted and on which Reagan turned his back." Shultz went on. "I guess the point I'm making here is that ideas matter a lot, the underlying ideas that stand behind policies. When you don't have ideas, your policies are flip-flopping all over the place. When you do have ideas, you have more consistency. And when you have the right ideas  then you can get somewhere." Reagan had the right ideas.